If practice is important, how can parents encourage students to engage in practice between lessons? Here are some suggestions that I hope will be helpful! As we all know, it can be difficult to implement changes. I know from experience, as a parent myself! We are all learning all the time, right? Q. 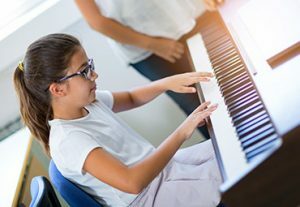 Do students need to practice everyday, and if so, how much? Music is a skill that is learned like any other: through repetition. Frequent review will cause a student to master the skill more quickly. This is the case in favor of practicing at home between lessons. * I recommend that kids practice 3-5 days per week for 5 minutes of every grade level. That is, a first grader could practice 5 minutes at a time, whereas a 6th grader should be able to handle 30 minutes at a time. If you aim for 5 or 7 days, maybe you might hit 3-5 days of practice? Q. Will a student continue to improve if they don’t practice? * Yes, they will continue to improve if they only practice at their lessons, just not as rapidly as a someone who engages in a daily practice regimen. Q. Why is it so hard to get kids to practice? * One reason why practicing is hard is because it is a mental activity that doesn’t just instantly grab one’s attention. Today, our culture battles the attraction and distraction electronic games. These things by nature instantly grab one’s attention. And if they don’t, it’s a just one quick click to move on to something more interesting. Practice requires the ability to settle in and concentrate without necessarily being entertained.